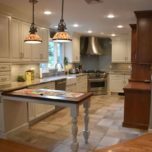 Restaining your kitchen cabinets is a great way to give your kitchen a new look without signing up for an entire NJ kitchen remodeling project. The process of restaining will completely transform your cabinets! What color should you restain your kitchen cabinets? 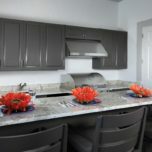 The first decision to make is whether you want your kitchen cabinets to be darker or lighter after the process. If you want to stain your cabinets darker, all you have to do is apply a gel stain over the existing finish after some light sanding. However, if you want to lighten your cabinets or stay close to the shade you have now, you have to remove the old stain completely. 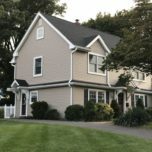 Obviously, going darker is the easier option, but it depends on your personal preferences and your willingness to put some elbow grease into the process. One quick note as you’ll see below, not all wood types are suitable for a darker stained finish so you will need to determine which type of wood species you have to work with first. Which wood types are best for restaining kitchen cabinets? 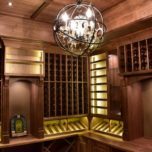 There are many different types of wood species available that are made into kitchen cabinets that are very suitable for a light or dark stained cabinet finish. Some of the most commonly used wood species are: Cherry, Maple, Alder, Walnut, Hickory and Oak. 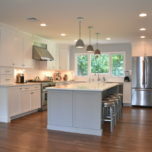 Cherry kitchen cabinets are the single most popular type of stain the cabinets. The cherry wood species takes a stained finish very well and develops over time into a very mellow finish. Maple is most suitable for a lighter stained finish as it tends to get blotchy on the darker side. Alder is similar to Cherry but not quite as good. Walnut, Hickory and Oak are all similar open grain wood types and take a light or dark stain very well, on the darker side the open wood grain will be very pronounced. The next order of business when restaining your cabinets is to make sure to cover all the surrounding surfaces. This will protect them from sanding debris and the stain itself. Not doing so can result in disaster. Start by applying a painters tape in all areas where the cabinets abutt other surfaces. Then tape plastic sheets to the surrounding areas to protect them from possible splatter and sanding dust. Assuming you will be restaining your kitchen cabinets lighter – you will need to strip the old finish of the cabinets completely by either sending it out manually or using a chemical stripper or a combination of the two. Consulting a local paint store with a sample of your cabinet door in hand would be the best recommendation at this point . Depending on how dark you are looking to go, you might have to use more than one coat. Open windows before starting, especially if you are going to be doing multiple coats. If you are unsure as to how many coats you need, call a NJ kitchen remodeler. 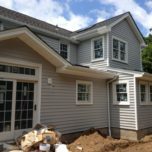 Our professionals can talk you through the process. Above all, read all directions and follow carefully. This is not a project you can afford to ruin. 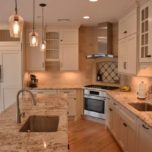 Is restaining your kitchen cabinets a durable solution? 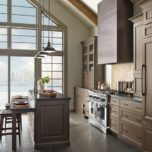 Absolutely nothing compares to the quality and durability of a professional cabinet finish that is performed at the factory in a controlled environment. 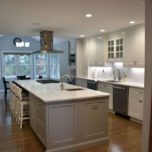 Having that said, you can certainly give your kitchen and updated look and do a quality job with the right guidance and products. It certainly is a big undertaking so be prepared to put in many hours.